Honoring Devon Walker with the retirement of his number in all sports. Also honoring former coach Mack Brown on his upcoming induction toe the Hall Of Fame. Last edited by winwave on Fri Aug 31, 2018 8:34 pm, edited 1 time in total. PS y'all, if you're copying a Twitter link (it has to be the full, regular link from the browser and not their minified version), use the toolbar and surround your link in the tweet tags, and the site will display the Tweet contents embedded. Just let it rain and be done with it. I'd imagine it's typical New Orleans weather for this time of year? Hot and humid with high probability of thunder storm at some point that will not only not bring any relief, but actually add to the humidity? Here in CT we have a heat advisory, with the heat index running above 100. It's hot and humid, for sure. But not like the day we opened Yulman. That might be the hottest day of my life. It's actually been raining ALL morning since about 10AM. The tailgate will be a mess. Rain chances are supposed to drop to 15% come game time. And as I type that, I'm pretty sure lightning just struck my building here in the CBD. It just started in Metairie. Weather hasn’t been that humid. 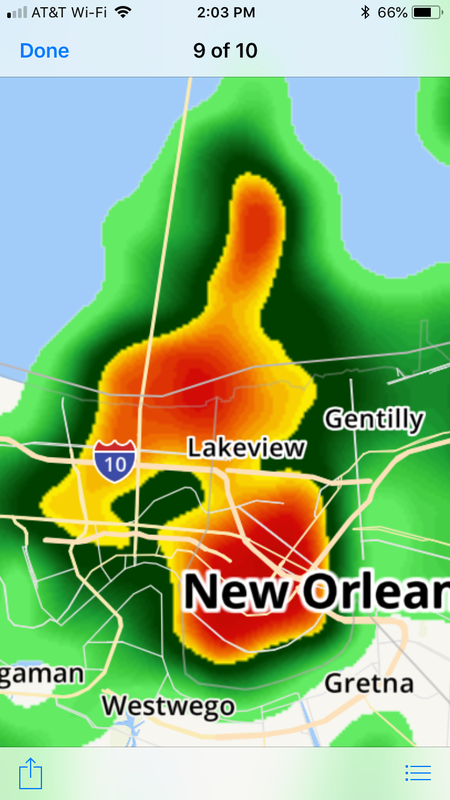 Was pouring here in Mid-City about an hour ago.. Looking out over the CBD and Uptown and no more rain. Skies are beginning to clear. There is a large number of thunderstorms extending as far east as Mobile that are moving westward. However, the tendency seems to be for many to evaporate when they hit Lake Borgne. I'm hoping for the weather conditions that give Wake Forest the most trouble. For what it's worth: It's 89 and humid (feels like 96) in Winston Salem today. I don't think they're going to be any more affected by the heat and humidity that we are. I'm outside the Westfeldt entrance and the weather is fine. Very humid but no rain. Btw I need a ticket! Embarrassing crowd. Looks like no more than 4,000. I know the Saints are playing in the dome and it’s a school night but man it’s empty. I wouldn't say it's 4000, but it might not be 10,000. Those that are there can tell us better, but probably are not posting from Yulman. As the first quarter comes to an end, I have to say their true Frosh QB is outplaying our 5th year Senior. To this point. We have a chance to turn that around, I hope we do. Other than the toss to Encalade, I don't think we've done much. Encalade should have caught the 3rd down pass at the goal line. Banks isn't playing bad, but the kid had them marching there at the end once he found his stride. Banks is not only NFL material, he's not Div 1 material And our wide receivers are terrible. Other than that we are toe-to-toe with WF.